Last time we checked there were about 23.543.820 reasons to start with Youtube Video Advertising ASAP. Wait, what? I just overheard someone say 23.543.821 reasons. OMG, where to even start! Obviously, this blog post will turn into a book and into a library if I had to go explain all of them at once. So, let’s just start with the top 2 reasons why you should be using Youtube Video Ads for your business. 1# Nobody is doing it yet. A.k.a. low costs and high click through rates. Ok not “nobody”, but as we speak only a handful of people are doing it. As a matter of fact we’ve created our whole product around it, to help you do it as well. But, the truth is that most small businesses are not yet aware of the amazing results you can achieve, specifically with Youtube InStream Video Ads. If you spend any time in entrepreneurial forums, you’re probably aware that Facebook Ads are all the rage. Facebook has been and still is an amazing platform for us to connect with our target audience in a relatively cost effective way. However, when an advertising space gets more crowded, clicks become more expensive. Once everybody and their mother is trying to target an ad to the same person on the same platform, the costs obviously go way up. This is not yet the case on Youtube. How does an 80% click through rate sound to you? And costs as low as 8.6 cents per click? These are real life results from our own tests doing Youtube Instream Video Ads. Make sure to sign up for your free demo to learn more about how you can do the same. 2# Nobody is doing it right. A.k.a. an opportunity to differentiate yourself. Apart from a handful of Youtube Ad Experts that help their clients create powerful and targeted ads, most big brands use Youtube Video Ads in the same way they use TV commercials. Well, it’s similar to what you experience when you watch TV. A lot of ads either don’t apply to you (because they’re not targeted right) or are just plain annoying because you smell “ad” from a mile away. The incredible targeting options that Youtube offers, combined with the power of video to make a true (personal) connection is a GOLDMINE for businesses. And one that a lot of the big brands aren’t taking advantage of yet. For example, one of the powerful ways you can target on Youtube is by using Placements. This means you can upload a set of individual video links to your campaign, on which your video ad is going to run. Because, if someone is about to watch a video called “how to dress up your puppy”, it’s quite likely that they’re also interested in your custom dog mullet headband with hair extensions – video ad! Not even kidding, this is an actual product (yes it’s on Amazon guys). That’s some pretty sweet targeting right there. And guess what, if they AREN’T interested in your custom dog mullet headband with hair extensions (hard to imagine! but hey), they can SKIP your ad and it won’t cost you a thing. Yes, you heard that right. And it gets even better! If people skip your Youtube Instream Video Ad OR click through to your website before the 30-second mark, it won’t cost you a dime. So, what are you waiting for? It’s quite likely that your target audience is part of the 1 billion users Youtube now has! If you are as excited as we are, click here to sign up for your free Veeroll demo. And learn how we can help you create highly (cost) effective video ad campaigns at the speed of light. Do you have any questions about how Youtube Instream Video Ads work? On how to get your targeting right, how to write outstanding scripts or how to create compliant landing pages? Or how to optimize your campaign to get the best ROI? 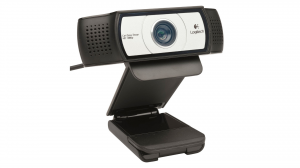 Leave a comment & win a Logitech C930E webcam. We want to make the blog as useful as possible to you and help you get great results, so we’d love to hear how we can help. If you leave a comment BEFORE this Friday (EST) with your most pressing Youtube Video Ad related question(s) you have a chance to win this baby, a Logitech C930E webcam. We’d love to hear from you, so don’t procrastinate and leave a comment now!